White Mountain Lake is Arizona's largest private lake at almost 350 acres and is just a few minutes from Show Low, Arizona. Swimming: Can you swim in the lake? Yes swimming is allowed, beach on west shore of lake. Water Level: Average water level variance? Water level variance is 10 feet. Boat Docks: Are they permitted? At this time the lake has two public docks and one available for seasonal slip rental. Power Boats: Are they permitted? Power boats are permitted, no horsepower limit. Building restrictions: Property close to lake are site built only homes, minimum 1000 sf foot print. Show Low Parks & Recreation (520) 537.2800. Snowflake City Park - 1 block west of Main Street. Taylor City Park - 7 blocks west of Center Main. Woodland Lake Park - Woodland Lake turnoff, off SR 260 (2 lighted diamonds). Show Low, the commercial and tourism hub of the White Mountains, was established in 1870 and incorporated in 1953. Located in southern Navajo County at an elevation of 6,400 feet, the city is 175 miles northeast of Phoenix and 195 miles north of Tucson. Show Low received its name when C. E. Cooley and Marion Clark decided there was not enough room for both of them in their settlement. The two men agreed to let a game of cards decide who was to move. According to the story, Clark said, "If you can show low, you win." Cooley turned up the deuce of clubs and replied, "Show low it is." Show Low offers many year-round recreational opportunities and points of scenic interest. The Apache Sitgreaves National Forest, with 58 campgrounds, trails, and pristine lakes, surrounds the city. The scenic White Mountain and Mogollon Rim areas are also nearby for campers and fishermen. Arizona's only covered bridge is located in Pinedale, 15 miles west of Show Low. Apache, Navajo, Hopi, and Zuni Indian Reservations are nearby. The city has a new indoor aquatic center, five 18-hole golf courses within 20 miles, and numerous motel and RV accommodations. Boating and fishing are popular in many lakes and streams in the area, including Rainbow Lake, Show Low Lake, White Mountain Lake, and Fool Hollow Lake Recreation Area. Snow skiing is available at Sunrise Park Resort on the White Mountain Apache Indian Reservation. Pinetop-Lakeside is an incorporated community located in the scenic White Mountains of Arizona. Founded in the early 1880s by Mormon pioneers, Lakeside derived its name from the area's lakes, and Pinetop derived its name from the nickname of a saloon keeper who served the Fort Apache soldiers. The two communities incorporated as one town in 1984. Pinetop-Lakeside, at an elevation of 7,200 feet, is known for its extensive tourism and recreational activities, proximity to the world's largest stand of ponderosa pine, and for an outstanding quality of life. From Phoenix, U.S. 60 through the scenic Salt River Canyon or state Highway 260 through Payson will lead to Pinetop-Lakeside. 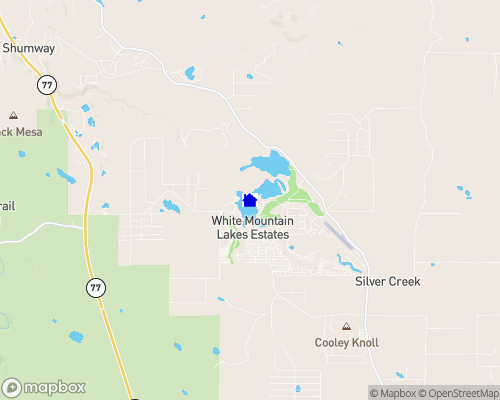 Pinetop-Lakeside is surrounded by the natural beauty of the White Mountains, the Apache/Sitgreaves National Forest and the White Mountain Apache Indian Reservation. Hiking, biking, and horseback riding are popular recreational activities on the over 180 miles of developed multi-use trails, which are part of the White Mountain Trails system. The area was ranked third best Trail Town in 1996 by the American Hiking Association. Hunting and fishing are also popular recreational activities, and picnic and camping facilities are provided throughout the area. The reservation alone has more than 300 miles of streams and 26 major lakes. (A special use permit is needed on the reservation.) Rainbow, brown and brook trout are the primary fish caught in the numerous public, and one private, fishing lakes in the area. A winter sports complex, Sunrise Park Resort, located 30 miles east of Pinetop-Lakeside on the White Mountain Apache Indian Reservation, attracts skiers from around the southwest as well as internationally with its well-developed slopes and facilities. Pinetop-Lakeside is noted for its golf courses and Woodland Lake Park with its excellent recreational facilities. Cross-country skiing, sledding, snowmobiling and ice fishing can be enjoyed during the winter. Immediately south of Pinetop-Lakeside is the Mogollon Rim. The Rim is a steep escarpment ranging from 1,000 to 2,000 feet in height, which separates Arizona's northern plateau region from the lower deserts of central and southern Arizona.